This past year was one filled with bad news for our local waterways. From turtle kills to fish kills to toxic red and blue-green algae blooms, it seemed not a week went past without bad water news. 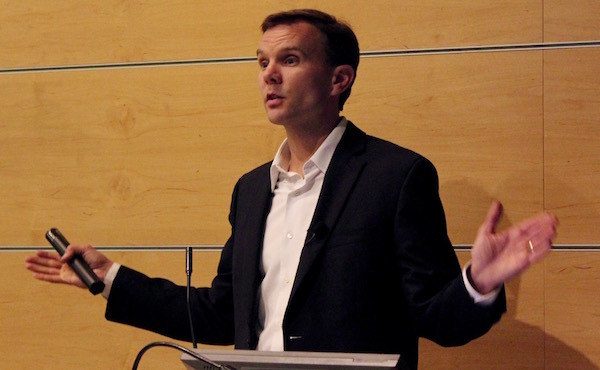 But the silver lining in that bad news is that both government and the general public have awakened to the problems facing our local waters, says Dr. Christopher Gobler of Stony Brook University, who gave his annual “State of the Bays” address at Stony Brook Southampton April 1. “Long Island has had a great epiphany the last couple years,” he said. “All of Long Island is a watershed. Dr. Gobler, who specializes in studying harmful algae blooms, was part of the research team that worked to figure out what killed hundreds of diamondback terrapin turtles in Flanders Bay last April and May. The scientists doing the research found levels of algae that produce the neurotoxin saxitoxin at seven times the limit for human consumption in nearby Meetinghouse Creek in Aquebogue, coinciding with the turtle deaths. These small turtles eat shellfish, which in turn filter algae, including the algae that produces saxitoxin. At the levels found in Meetinghouse Creek at that time, the turtles would have received a toxic dose of saxitoxin after eating just one mussel, said Dr. Gobler. Sure enough, after scientists did DNA analysis of the animal material in the stomachs of the turtles, they found that every dead turtle had the DNA signature of mussels in their stomachs. Also this past year, a research group put together a thorough analysis of the fish kill that killed about 400,000 bunker in the mouth of the Peconic River. Dr. Gobler said that, due to an overabundance of algae, which respirates at night, there was no oxygen in the river at the time of the fish kill. The fish were also suffering from a dinoflagelate that damaged their gills, and there were a larger than normal number of fish in the river at that time. 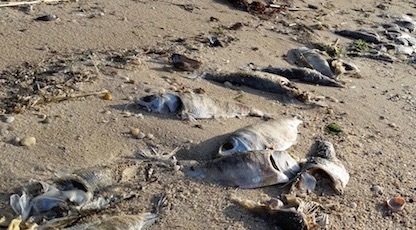 Dead fish washed up throughout the Peconic Estuary last spring. In both the turtle and fish deaths, algae blooms fed by higher than normal levels of nitrogen in groundwater seeping into the bays played a major role in the deaths. One researcher in Dr. Gobler’s lab has found that the chemical structure of the deadliest algae is dependent on high nitrogen levels — making it more likely that toxic algae will grow in the presence of nitrogen. The good news this year, he said, is that “politicians are owning the issue,” acknowledging that substandard septic systems are responsible for about 2/3 of the nitrogen entering the bays. Dr. Gobler said Suffolk County’s work on improving water quality has brought in millions of federal dollars to help the bays. One of the most hopeful steps forward, and the one that seemed to garner the most audience attention Friday night, is the Suffolk County Health Department’s consideration of “shallow drain leaching fields” as alternative septic systems. The fields consist of perforated PVC pipe, known in the industry as French drains, placed in a shallow trench above a layer of sawdust and a layer of sand, which serves as a natural and inexpensive nitrogen filter. Dr. Gobler said these systems are in place throughout the United States, and Suffolk County is one of the few places where they are not approved — in part because Suffolk’s thinking on septic systems has long been to make them as deep as possible, in order to keep pathogens as far away from people as possible. But, with rising seas and saltwater encroachment into the ground, these drainage systems may not just be convenient in the future. They may be necessary. Dr. Gobler said that teams are working in the south shore estuaries on projects that could help the bays ranging from macroalgae collection to the first oyster reefs on Long Island to the reseeding of clam beds. Dr. Gobler also pointed out that, when sewage outflow pipes are diverted away from shallow, slowly draining estuaries and out into the open ocean, seagrass beds also recover. Such was the case in the Great South Bay when the Bergen Point outflow pipe was moved out to the ocean, and such was also the case in Mumford Cove, Connecticut, due north of Orient. When those seagrass beds reappear, he said, fish and shellfish are given back the best habitat they could have. Dr. Gobler also pointed out that, after 15 years of constant work and monitoring the health of the Long Island Sound, 2015 was the first year there was no “dead zone,” where there is no oxygen in the water, in the Sound. Last year, also, large numbers humpback and beluga whales were spotted in the Sound for the first time in decades. “When effort is put in, the system can respond and recovery is possible,” he said.